Training is a vital element of any manufacturing system. At Mikron, our structured training programs are designed to enable our customers to be self-sufficient for the majority of their needs. Customer training in our dedicated center include the standard mechanical, pneumatic and electrical parts of your machine. 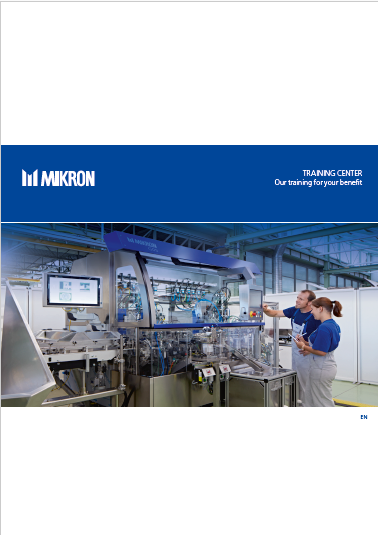 We provide hands-on training to your operators and maintenance team that focusses on reducing the adoption period of the machine, minimizing downtime and enabling them to access all of the benefits that Mikron solution has to offer. We offer a large choice of specific training to respond to all our customer’s needs. All the participant will receive a “Mikron Training Certificate “. Some training courses can be customized to your system and be held in your facilities in front of your own machine. Mikron Customer Service offers courses tailored to the requirements of participants and the machine configuration. All the participant will receive a "Mikron Training Certificate".